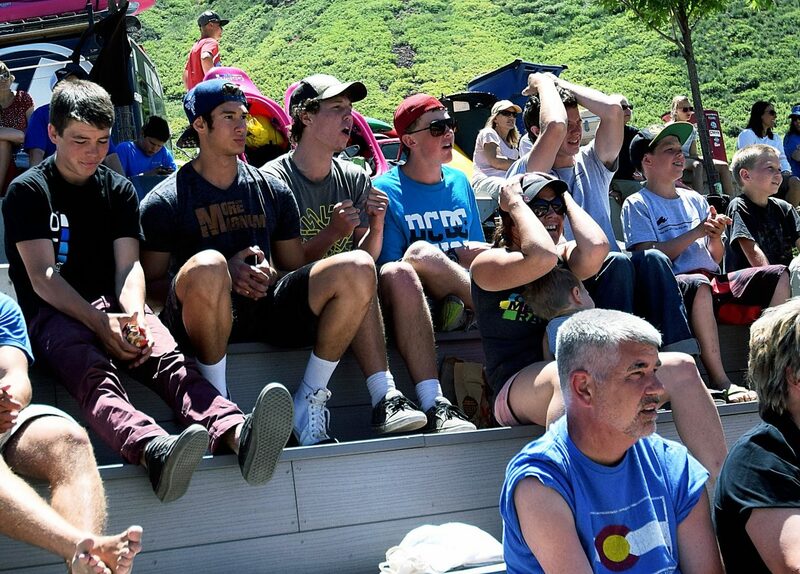 Members of the Kellogg family react after 16-year-old Kady Kellogg misses a trick while competing in the U.S. Freestyle Kayak Team Championships on Monday in Glenwood Springs. 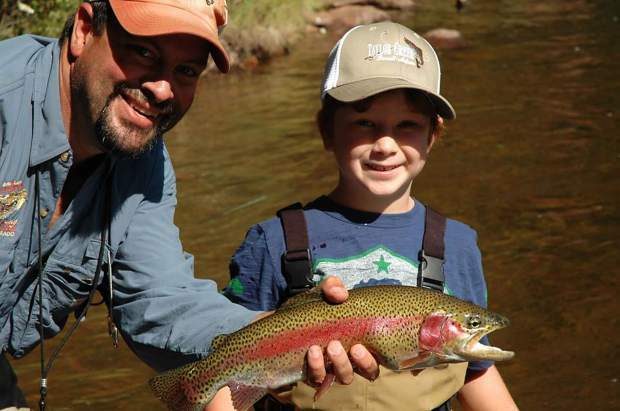 The family is an avid group of kayakers who say their favorite places to travel are "anywhere around water." Kerrie Kellogg, center, plays with one of her brothers and sisters in the family RV in Glenwood Springs this past Monday. 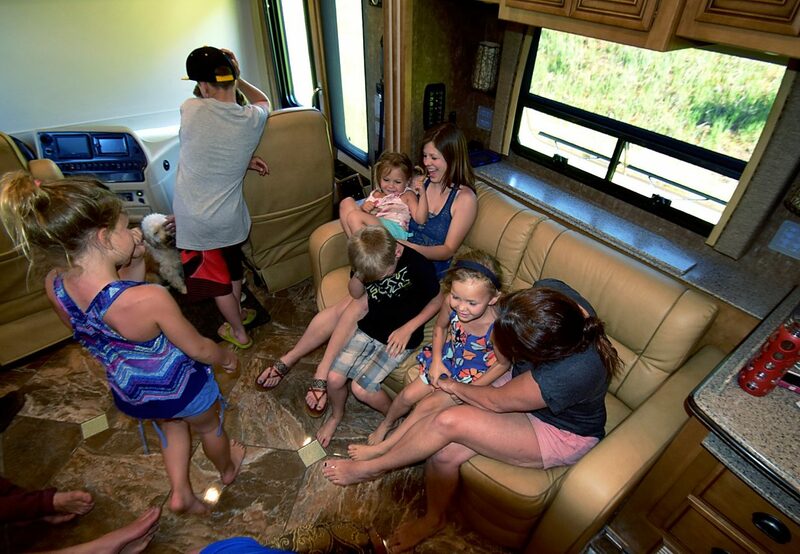 The 21-year-old Glenwood Springs High School graduate is one of 12 children in the Kellogg family, which reside in the RV and use it as their primary residence while traveling around North America. 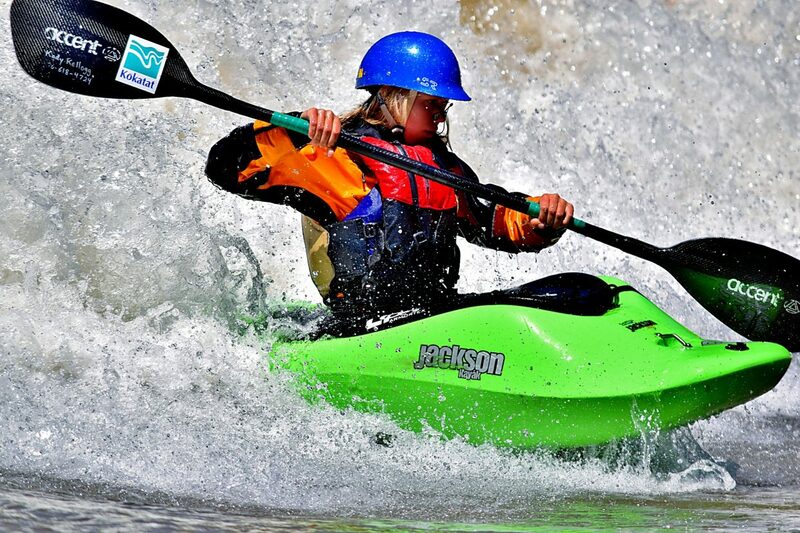 Kady Kellogg of Glenwood Springs competes Monday in the U.S. Freestyle Kayak Team Championships in Glenwood Springs .Kady and her brother, Brody, were team members who competed on Monday. Susie Kellogg shows off some of the features of the RV the family lives and travels in. This newer RV, which they got earlier this year, includes a pair of bathrooms, two flat-screen televisions and a full-sized refrigerator, none of which were available in the RV they'd previously been living in. 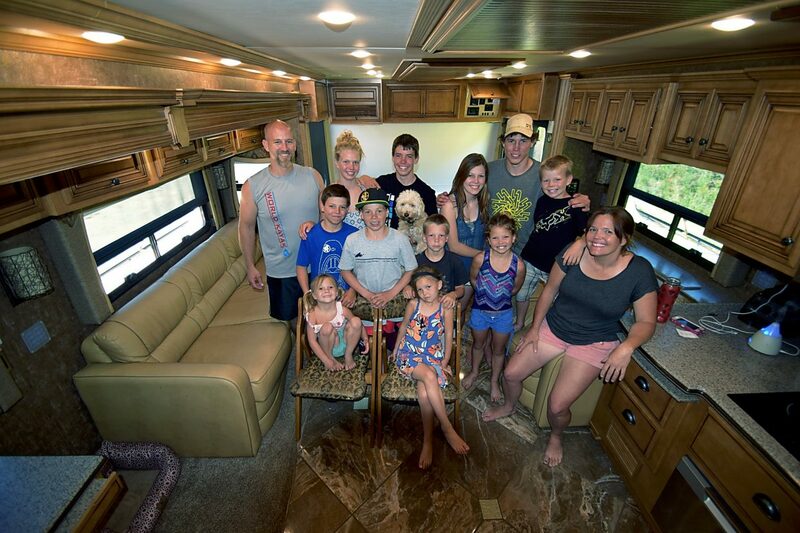 The Kellogg family in their RV, from left, top row: Dan, Kady, Brody, Eddy (the dog), Karrie, Grady and Rowdy; middle row: Dally, Kenny, Cardy, Maddie, and Susie; and bottom: Elly and Emmy. Not pictured because he was taking a nap: 2-year-old Coby. Kerrie (21), Grady (19), Brody (18), Kady (16), Kenny (15), Dally (13), Cardy (11), Maddy (10), Rowdy (8), Emmy (6), Elly (4), Coby (2). The family also has a 3-year-old mini golden doodle named Eddy. 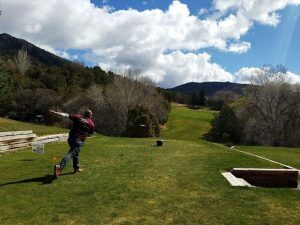 GLENWOOD SPRINGS — The Kellogg family home has all the things you would expect to find where a big family lives. The Kelloggs have a pair of flat-screen televisions, a full-sized refrigerator, an oven, a range and beds for everyone. 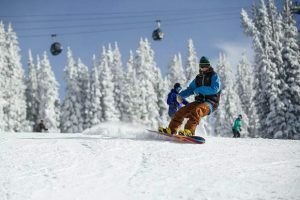 They also have wireless Internet, and it’s pretty common for members of the family of 14 from Glenwood Springs to be waiting in line to use the bathroom. But those typical features aren’t in a typical home. The Kelloggs — two parents, seven boys, five girls and the family dog, Eddy — all live in a truly mobile home that travels the North American continent year-round. The Kelloggs are in their third year of living in the RV, which earlier this year was upgraded from a 1999 Cruise Master to the Newmar they’ve been rolling around the country in since May 1. The dad, Dan, said the family has driven more than 60,000 miles traveling to places in eastern Canada, up and down the U.S. East Coast, Texas, Florida and California, among other places. Susie said the only two states the family hasn’t visited in the continental U.S. are Washington and Oregon, but they hope that a West Coast road trip will happen in the near future. Along the way, the Kelloggs’ mobile home has also become a mobile reality show that’s won recognition around the world. Not only do they have a weekly show on the Internet called “The Kellogg Show” (found at http://www.kelloggshow.com), but the family has been featured by nationwide television entities like Nickelodeon and “The Today Show.” Their Facebook page has 5,819 followers through Tuesday afternoon, and they regularly have people come up to them on the street to say hi wherever they are. Some of the YouTube prank videos on the family’s site have garnered millions of views in the Internet. The traveling started when Dan got into kayaking and brought the whole family in on it in 2010, not long after the Glenwood Whitewater Park was built in West Glenwood. So after spending hundreds of hours on the play wave, the family wanted to do kayaking events in other parts of Colorado. The only way to feasibly do it would be to buy an RV, which Dan did in 2011. Then, after making a three-month road trip to Tennessee, one family member suggested that they just live in the RV all the time. That’s when the traveling really began, making the consistently mobile family a sponge that absorbs and learns from the cultures and places they travel to. While experiencing all of this, the Kelloggs have retained their ties to Glenwood. The family still owns their West Glenwood home and rents it to summer raft guides and a sheriff’s deputy while they’re touring the continent. 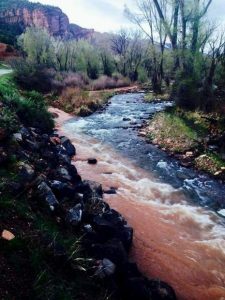 Kerrie, 21, a 2012 Glenwood Springs High School graduate and the oldest of the 12 kids who now works as a rafting guide in Glenwood, is in charge of getting the family mail to where it needs to go. The family still wants to go to lots of places. Immediate plans for the dozen-plus are to stay in Colorado for a few months and go places they haven’t been yet, such as Durango, Gunnison and the Great Sand Dunes near Alamosa. Dan continues his work as a software engineer, meaning that he can make a living working from home so long as there’s Internet access. And through their online show, the Kelloggs have picked up sponsorships from kayak and travel entities alike so they can continue their seemingly neverending road trip. Their new RV also makes life easier, giving the family a standard-sized refrigerator and the use of two bathrooms — both of which were lacking in their previous RV. There also doesn’t appear to be any end in sight for this road trip. Susie said that the family will continue traveling until one person — just one — speaks up and says they want to go home.